VOA Special English - Learning Passive Modals: It Can Be Done! Your passport has to be renewed. Your hair still needs to be cut. Your shoes should be repaired. And your dog is supposed to be taken to a friend’s house. 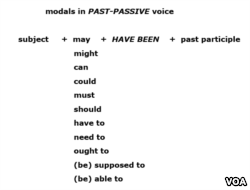 All of these sentences use either modals or something called “phrasal modals,' and they are in the passive voice. You may remember that, in a passive sentence, the person performing the action is not stated because it is not very important to know who that person is. For example, in the sentence about the haircut, the listener does not know who will cut your hair. But that is ok, because it is not very important to that statement. 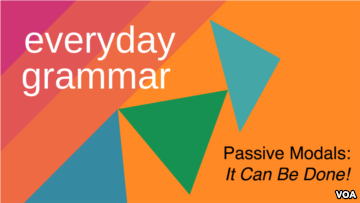 You may also recall that, for the passive voice, we use the structure be + past participle, as you noticed in all of the example sentences. Modals are helping verbs that express possibility, ability, duty, permission or advisability. Words like can, could, may, might, must and should – and even will – are all modals. 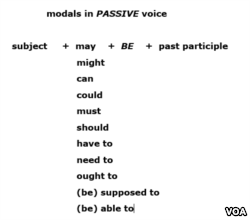 But modals also include something called “phrasal modals” – phrases such as has to, ought to and be supposed to. As you heard in our examples at the start of the program, we sometimes need the passive form of modals and phrasal modals. But, don’t worry! This is surprisingly simple. The structure is: modal or modal phrase + be + the past participle. 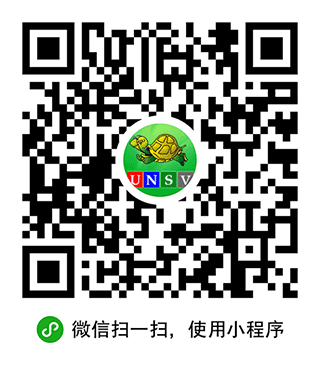 ​For example, in the sentence about the haircut, need is the modal. Then comes the verb be, and its form does not change. And, cut is the past participle of the irregular verb to cut. Ok, now imagine that some of the things on your travel “to do” list are complete. But, some of the other things still need to be completed. How can you tell someone this using the past tense of modals and phrasal modals? For all modals and some phrasal modals, the only difference is changing be to have been. So, the structure becomes modal or modal phrase + have been + the past participle. Listen to an example. My shoes should have been repaired last week. In this sentence, should is the modal. Then comes have been – which stays the same – plus repaired, which is the past participle of the verb to repair. But for other phrasal modals – ones that contain the verb be – the be changes to past tense. This includes the phrasal modals be supposed to, be able to and be allowed to. The structure for this is: past tense form of be (with) phrasal modal + have been + the past participle. My dog was supposed to have been taken to a friend’s house. Here, the be changes to was. And notice that the words have been still do not change. And, the past participle of the verb to take is taken. But, what if you want to ask a question? Using the question form of many English grammar structures can be tricky. So let’s try to make questions out of a few of our example sentences. When asking a yes-or-no question, the question can begin with one of several words. For instance, it may begin with the modal, such as should, can and could, or with the word do, did or does or is or are? Does your passport have to be renewed? Is your dog supposed to be taken to a friend’s house? Should your shoes be repaired by next week? At times, it is best to avoid the passive voice; the sentence structure can create unclear statements. And, in some types of academic writing, such as essays, passive voice is usually discouraged. However, in other types of written and spoken communication, it is readily used. You will see and hear the passive voice in written and broadcast journalism, scientific writing and sometimes in formal letters. And, of course, we use the passive voice in informal speech and writing. So, it is useful to know how to use passive modals. 2. Think about what is happening around your city. What are some things that need to, should, could or may happen or have already happened? For example, do the streets need to be repaired? For this practice, you can use the passive form or past-passive form. Here’s an example: “The new metro station should be completed in 2018.” That's the passive modal. Or “The new metro should have been completed in March.” That's the past-passive modal. And, if you're feeling brave, you can even try using the question form of passive or past-passive modals. Learning these grammar structures is not too difficult, and I am here to tell you this: it can be done.